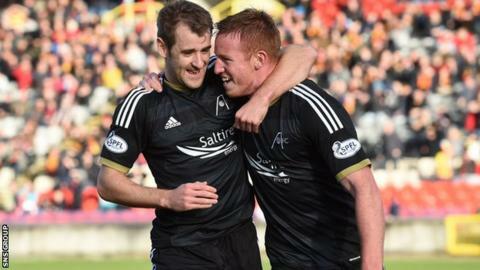 Aberdeen duo Adam Rooney and Niall McGinn have signed contract extensions at Pittodrie. Dublin-born striker Rooney, 26, who has scored 17 goals this season, is committed to stay on for another three-and-a-half years. And Northern Ireland international forward McGinn, 27, is tied to the Dons until the summer of 2017. Striker Lawrence Shankland, 19, and defender Scott McKenna, 18, have also agreed two-and-a-half year deals. "Adam and Niall are key players within the team while both Lawrence and Scott have the potential to develop into first team regulars in the not too distant future," manager Derek McInnes told the club website. "I've always said that, while we've enjoyed a fruitful 2014, there is still a great deal of work to be done and securing players, who we want to be part of our journey, is vital if we want to achieve the success that everyone at the club craves." Former Inverness CT striker Rooney moved to Pittodrie from Oldham in January, while McGinn has been at the club since the summer of 2012, with both men playing in last season's League Cup final triumph.